I spent almost the entire day clearing the storeroom today, something that I had procrastinated for a long time. My aim is to impress your mother with a storeroom that she could actually walk in and access the things she needs. Before today, it is so full that the door could hardly be closed. Now, there is actually leg room (although not a lot) and things are stacked more neatly. Decide what to keep, i.e. Should I keep, give away, or discard? As expected, simple isn’t necessary easy, especially with step 2. There were several items which I haven’t used for a long time and unlikely to ever use them again (e.g. the ‘doctor suitcase’ which I bought myself with one of my first pay cheques, old magazines that featured articles I had written, stacks of handwritten notes made as I was conceptualising my businesses, old name cards, etc.). To let go of something is to release our grasp. The most common ‘thing’ that ought to be let go of is resentment. Resentment is essentially the result of unexpressed anger. It’s one of the most common barriers to happiness. Left unaddressed, resentment is highly toxic and causes a strain on our relationship with another. Is there anyone that you resent, even in a small way? Try letting go of such feelings by inhaling deeply, holding the resentment in your tightly clenched fists, and letting it go as you exhale gradually while you release the tension in your hands. Repeat it several time and watch your anger or resentment dissipate each time you release your grasp. Does your heart feel a little lighter now? You now have a remedy for a heavy heart. Letting go is a solo exercise, you could do it on you own anytime and anywhere. Remember to use it when needed. Happiness is just one choice away. Everybody wants to be happy, and yet there are many unhappy people in the world. As human beings, being able to experience both happiness and unhappiness is perfectly healthy. What’s undesirable is getting stuck in the latter for a long time. Life is too short to be filled with excessive sorrow or unhappiness. You see, human beings are inherently ‘wired’ to want to be ‘right,’ as if the survival of our ego depends on being right. We want to be right about our beliefs, judgment, assertions, etc. and would put up a good fight to defend them when challenged. However, having observed many unhappy people so far, I noticed something common in them. They rather be right at the expense of their happiness. They hang on to unpleasant experiences far longer than they should, hold on to grudges and resentment, secretly wanting to make other people ‘wrong.’ I often wonder what it would be like, if only they are willing to make one simple choice … to give up the need to be right, and let the possibility of happiness unfold again in their lives. So, next time you get into a conflict or unhappy situation with someone, remember … your happiness is just one choice away. 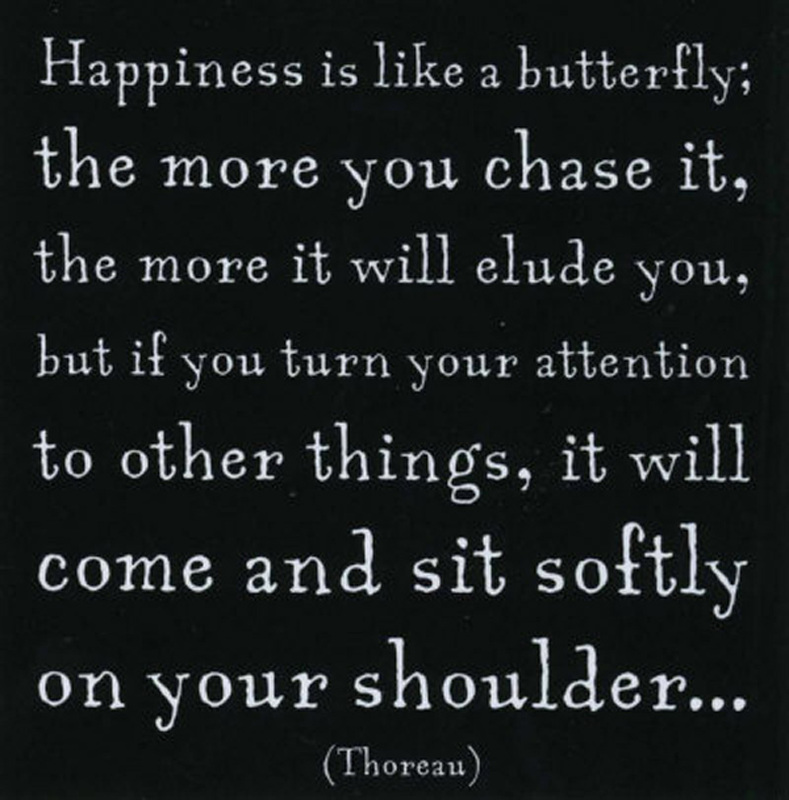 Imagine Dad standing before you, asking “Son, do you rather be happy or be right?” I hope you will make the ‘right’ choice, and attract the butterfly (as Thoreau put it) to come and sit on your shoulder.